Cape Town - With World Rugby set to announce the hosts of the 2023 Rugby World Cup on Wednesday afternoon, Ireland will be hoping that their last-minute lobbying will pay dividends. South Africa are World Rugby's recommended hosts, but ever since that announcement came on October 31, Irish Rugby has been fighting its way back into the conversation. Now, with all of the lobbying done and dusted, the three countries in the running - Ireland, South Africa and France - must wait foe the World Rugby Council to cast its 39 votes on Wednesday. A simple majority of 20 votes secures the tournament, and while the World Rugby recommendation should be enough to get South Africa over the line, there are some who believe that there could be an upset on the cards. According to the Guardian website, South Africa's best chance of winning would be to secure 20 votes in the first round of voting. If they do not, and they have to go into a second vote against only Ireland once France has been eliminated, things could get a bit more tricky. The website says that "insiders" are of the opinion that SA Rugby CEO Jurie Roux's perceived "arrogance" since the World Rugby recommendation has not done him any favours. Ireland Rugby boss Philip Browne, meanwhile, sent a strongly-worded letter to World Rugby that questioned the findings of the recommendation report. While World Rugby threw the letter straight back at Browne, Ireland haven't gone away since then. 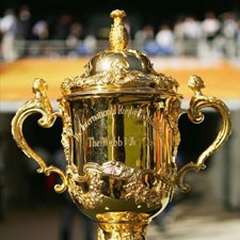 They will be banking on the support of the World Rugby Council members from England, Scotland and Wales, all of which have three votes. South Africa, meanwhile, will be hoping to secure three votes each from New Zealand, Argentina and Australia. The six regional bodies - Oceania, South America, North America, Africa, Europe and Asia have two votes each, with most of those expected to vote in line with the World Rugby recommendation. On the surface, it looks like South Africa will have enough support to get over the line. But, until the announcement is made official, Ireland will be backing themselves to pull a rabbit out of the hat. The announcement is expected to be made just before 15:00 (SA time).